Born in 1972 in Split, Croatia. He obtains his Master Degree at the Music Academy ”Ino Mirkovic“ in Lovran, in the class of prof. Goran Listes. In 2002 he won the first absolute prize at the 8th International Guitar Competition ”Citta di Casarza Ligure“. Holder of a variety of prizes by the Croatian Ministry of Education and by international commissions, for brilliant success of his students, with whom he has won more than 200 international prizes, not to mention the ones in Croatia. Performed as a soloist at various concerts through Europe as a soloist and a member of Trio Nata Bene with Russian musicians Vladimir and Natalia Balyk (accordion and domra), in the various duos with flutists (Sook In Lee – South Korea, Natali Youlzari – France) and violinists (Ino Mirković – Croatia, Jovan Kolundžija – Serbia and Montenegro, Orest Shourgot – Ukraine). 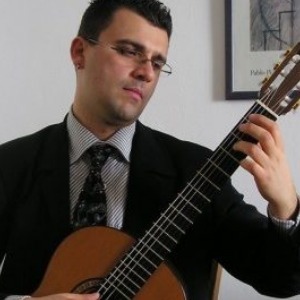 The past 20 years he spends as a guitar teacher, professor or lecturer in different music schools in Croatia, Bosnia and Herzegovina and Slovenia and he worked also as an assistant of professor Carlo Marchione at the Music Academy in Lovran, Croatia. International Guitar Festival ”Omis guitar fest“ in OmiŠ, Croatia.